This is a lazy post. I’ve wanted to write an intro to the extraordinary magic of networks but just haven’t had time to do it yet. 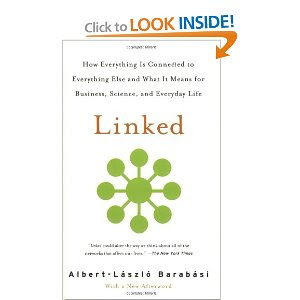 So for now I’m going to refer you to Linked, a book by Albert-Laszlo Barabasi, which is an easy read. At least check out the intro through Amazon’s look inside feature. Barabasi has been one of the pioneers in the study of networks, including human and cellular networks and has something to say about virtually every aspect of human networks. Madura is a for-profit social enterprise whose core business is providing small unsecured loans to the poor. In India and around the world microfinance is very much an evolving sector. Today microfinance is practiced either for-profit or not-for-profit, each with its own unique drivers. The prevalent for-profit approach is scale focused and profit driven. In this model the goal is to create a streamlined process for the disbursement and collection of loans that allows loans to be pushed out as rapidly as possible. Interest rates for this model generally range between 25 to 40% in India today. This is profitable business. Unfortunately it has also been widely publicized and hyped as a path out of poverty. On the positive side, it provides a conduit for more fund flow into the ‘subsistence’ economy and over time competition will result in innovations to reduce the cost of capital, and interest rates will come down. However, the social benefits are not sufficiently large or even noticeable from the outside and the social impact has been vociferously debated. In the quest for rapid growth, as people start getting multiple loan offers, a number of people who never wanted to go into debt find themselves in debt. Think of it like the temptation of getting multiple preapproved credit card offers. Yet this is not why microfinance has failed to have substantial socioeconomic impact. Rather it is because with poor knowledge levels and very limited exposure to markets and market opportunities, borrowers are not in a position to make productive and innovative use of the loans. So here one must resort to showing and glorifying as success a woman who has taken a loan of $300 and now nets an additional $10 a month, if you don’t factor in the opportunity cost of her time and labour. Personally, I find this depressing. The model generally practiced by non-profits takes a more holistic view of the borrower. Here, recognizing the disadvantaged conditions in which the poor operate, non-profits offer loans at low interest rates that are subsidized by grants and donations. Frequently they help the borrowers set up their businesses and market their products. The focus is on ‘enterprise creation’ and they become involved in every aspect. This approach has inherent limitations in its ability to scale. It is also implicitly paternalistic. To me it’s analogous to having a protectionist government where much of the industry is nationalized and subsidized. This breeds complacence and a lack of confidence. Those of us who remember India fifteen years ago, remember a nation that felt it held a secondary place on the global stage, a nation whose leaders assumed it could not compete on a global platform and closed its doors out of fear. But we have seen in urban India what liberalization can do. When the doors are opened, information and opportunities flow more freely and people who once thought that they could not rise to a global standard now find that they can. This is a systemic change that altered the paradigm in which we, its citizens, operate, the standard to which we are held, and slowly we all rise to it. So at Madura we are embarking on a different journey that is socially motivated but profit driven. The for-profit aspect is extremely important from the point of view of accomplishing anything with scale. In the absence of profit it will eventually fizzle out or hit a limit in its transformative potential. However, this has to encompass more than just loans and its impact has to be systemic in nature. Our belief is that the poor are not very different in the way they will respond to opportunity. However, they have to be connected in a network in which information and knowledge flows more freely so that they more rapidly encounter opportunities. Today they encounter new information and form new links or relationships at a very slow rate. The challenge is to speed this up. The belief is that with the right network conditions, people will become more innovative and productive in their interactions and socioeconomic transformation will be a natural outcome of these interactions. So where does this fit in with microfinance? Putting ideas into action needs money (most of the time) whereas money without ideas is just a piece of paper. Our strategy is thus based on the premise that if we have a network of credit enabled people sharing information and ideas, the network dynamics will work its magic. (What magic you might ask – I will talk about this in future posts). We have thus embarked on a journey of building a monetizable information delivery network that, together with efficient delivery of finance, creates a strong growing business. The test, however, is how well we leverage this to turn it into something far beyond a business. Succeeding in the ultimate goal will require some clever understanding of the properties of the human network we are working with so that we can affect it as intelligently as possible. And that, I think, is the exciting challenge in this whole effort. Where is this blog leading? Who’s your audience? Yesterday someone I know very well (no names will be named) asked me ‘What’s the purpose of your blog? Who do you want as your audience?’ So I said ‘What! Can you give me a break? This blog is only a couple days old’. ‘It’s just not evident to me what this is leading up to,’ unnamed person persisted. I won’t tell you what I said then, but grudgingly I’ll admit those are good questions. So here are the answers. 1) Explanations of different concepts underlying networks in nature, and network principles in general, and how they relate to the issue of poverty. These will be a little didactic but are concepts that will help in understanding other posts. Initially there will be more of these but over time that ratio will change in favour of the categories below. 2)Discussions of different approaches to tackling poverty and their successes and shortcomings. 3)Discussion of a network based approach to solving the problem of poverty using a for-profit enterprise model which will include empirical data and network models. 4)An update on the practical approaches and outcomes at Madura Microfinance where we will use network understanding to drive socioeconomic change. The audience I envision are people with an interest in the issue of poverty who 1) work in companies, government, non profits and other organizations who are curious about what science may have to offer as an approach on the frontlines 2) are scientists in the areas of nonlinear dynamics, condensed matter physics and other related fields who are interested in taking on research that can have immediate practical relevance. 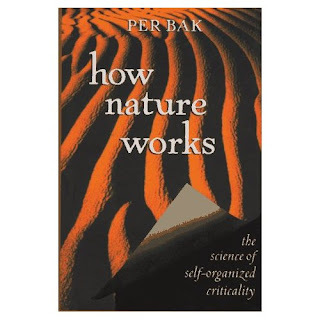 To get a feel for how much of Nature can be described by a power law and what could be behind this, here is a good book to start with: How Nature Works by Per Bak. Per Bak (now no more) was a physicist who developed a model that he called ‘self-organized criticality’ that produces power law outcomes. However, it is not the only model of dynamical systems that produces power laws. Consequently he did get quite a bit of criticism for stretching to claim that this (his model) is how nature works. Nonetheless it is an interesting read. As a general principle though, models of systems that produce power laws (like the one developed by Per Bak) are ones that are dynamic or in motion, and by their very nature are able to explain the coexistence of the few very large events (the accumulation of billions among a small number of individuals) and the large number of very small events (a huge number of people who have not acquired much money at all). This is a fundamental shift in thinking relative to the prevailing notion that the existence of billionaires (or rare events) is ‘anomalous’. Indeed billionaires appear to be a natural outcome of a dynamical system of money flow. When we enter a space our natural inclination is to do a quick visual survey of who’s around. When we walk into a first grade classroom for instance, we expect to see a whole lot of 5 and 6 year olds and one or two adults. Now if we were to plot the heights of the people in the room we would get a narrow ‘bell curve’ like distribution centred around 3.5’ and a point or two sticking out somewhere in the range of 5’and 6’. Let’s say I wasn’t there and all I had in front of me was the distribution that you put down. I could pretty easily guess what kind of situation this was. Where else do you have a bunch of small people with just one large person? Now instead, what if I showed you a distribution that looked like this? There are still thirty kids of the same size range. But now there are around 30 grown ups as well. Where would you find that kind of situation? If you guessed that it was one of the kid’s 6th birthday parties, you would probably be right. So every distribution has a tale to tell. And the tale runs deeper. It tells us something about the nature of height itself. The bell shaped curve suggests that the height of one child in the class is virtually independent of the height of the others. Indeed for each of us, our heights play out from a highly similar genetic program with small variations arising from random environmental events. It’s fairly easy to make sense of this kind of bell shaped distribution since we’ve all seen it in school. But what about the distribution of incomes? What tale does it tell? Why does it look so different? (To understand what income distributions look like, please read my earlier post Who cares about the average income!). These heavy tailed distributions and the power relationship that they often reflect, tells you that there’s no one size fits all, no meaningful ‘average’. More significantly they reveal a story of high interdependence, a story of a dynamically changing complex system. It is a reflection that my income does depend on yours in some very complex way. The distribution of income is a static view of a constantly changing interdependent process. Money is changing hands all the time and every so often we take a picture of how it is looks before it is passed on. This is fundamentally different from the story of the bell curve. And every small turn and kink in the distribution offers another twist to the tale. In my last, and much lighter post Who cares about the average income! I talked about the heavy tailed nature of income distributions. Here’s a link to some actual income distributions for the USA, India, Japan and France (scroll all the way to page 3 and look at Figure 1 on that page). Of course, the data for India includes only that of taxpayers and most of India has insufficient income to pay taxes so this is grossly misrepresentative. And unfortunately, the authors also note that the Indian data, even for taxpayers, is incomplete relative to the other countries for the reason that: “In spite of the best of our efforts in collecting the equivalent data from the Income Tax Department of the Government of India or the Reserve Bank of India, we are unable to give or compare with any better data”. 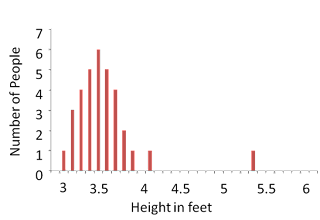 But before you eagerly click on the link, note that when you take a heavy tailed distribution that looks like the graph on the left below (where the number of people that have a particular income is equal to that income raised to some negative power) and convert the axes into log units it turns into a straight line which is easy to recognize visually. 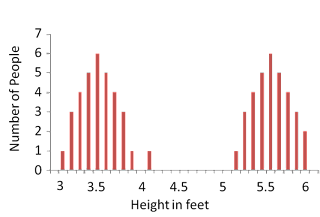 Since many income distributions tend to have such power law properties (misleadingly called a power law since there is no law here, it is just a power relationship), they are generally shown in the log-log coordinate form to easily be able to distinguish them from other kinds of heavy tailed distributions which are not power laws. It’s a pity that power law distributions are not taught alongside the normal distribution in school since if you work with them a few times they become as easy to intuit. More importantly though is that this arrangement describes so much of nature and society that we would gain a much better understanding of our world. Who cares about the average income! Many of us think of statistics as basically taking the average of some numbers. Maybe we even think of the normal distribution or ‘the bell curve’ and the concept of standard deviation. In this context, if you say the average height of people in India is around 5’ 5” with a standard deviation of 5”, it’s pretty intuitive what that means – that when you arrive in India you will find most people around 5’5” with some variation this way and that way of mostly 5”. In large part we all look similar and can fit in the same seats, sleep on the same size beds and fit through the same doorways. Instead, imagine if the distribution was not a bell curve but rather looked like this. A decreasing function with a heavy tail. What this would mean is that most people are less than a foot tall while a few are absolutely enormous 50’ giants (in the heavy tail) with the rest somewhere in between. In this scenario there is no one size fits all and it would be impossible for a randomly selected group to be comfortable sitting at the same sized table. The enormous giants the height of multi-storey apartment buildings would have to live in a different sort of world than their underfoot counterparts. The average height in this distribution is still around 5’5” but knowing this average, and even the standard deviation, would be completely uninformative. Rather what could prepare you for what to expect is to know something about the rate at which the distribution decreases, basically the exponent that describes the relationship. Now, unlike height distribution, which are bell curves, virtually all over the world the distributions of incomes and wealth display heavy tails. What differs between countries is largely the exponent. So if you knew nothing about India and you wondered what single number would best prepare you for the economic landscape, average income is really quite uninformative. Rather if you knew the exponent, or better still had a good visual of the distribution, you would come prepared to find Mukesh Ambani in a 27 story house on Altamount road surrounded by millions of abysmally poor people with barely a roof over their heads (and a little bit of everything in between). So, particularly from the perspective of understanding poverty, what we should care about is the exponent. Who cares about the average income! In a separate post I will talk about what gives rise to these different types of distributions and why income and wealth distributions looks like this. Stay tuned. 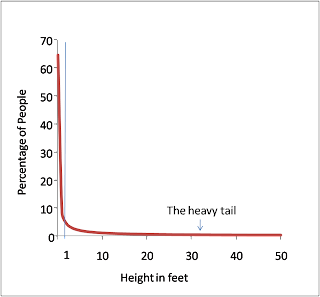 **Note that if you do decide to delve further into this, most people show heavy tailed distributions in log-log or log-linear scales to emphasize the properties of the tail so make sure you look carefully at the axes.